Friends of the River (FOR) San Bernard held it’s 11th annual River Cleanup on Saturday, Oct 10th. 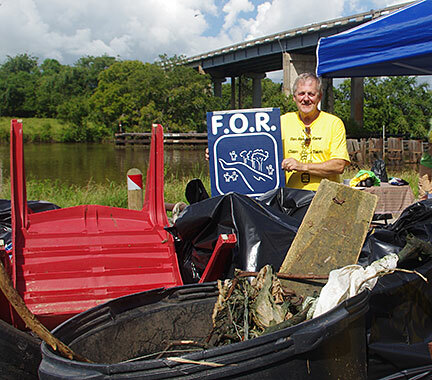 River resident volunteers and friends picked up trash from the riverbanks starting above Highway 35 at West Columbia to below River’s End at the Intracoastal Waterway. Volunteer Tim Logan reported the most unusual couple of items picked from the riverbank was a broken bottle of "Real Red Fox Urine” game lure and a 35-inch older box style television that was challenged by a nearby bull who did not want his MTV taken. If you are having a new dock built or repaired, please tell your contractor to collect any scraps! Lots of newly sawed dock board pieces were seen littering the river. Immediately following the event, volunteers were treated to a Hot Dog Social held at the FOR Community Center. Photos of the River Clean taken by Tom Folger are available now at www.folgerstudios.com.